Citroen's upmarket offshoot DS Automobiles has uncovered its new compact crossover at the Paris Motor Show 2018. The DS 3 Crossback will go on sale in 2019 and will be offered with petrol, diesel or electric power. Intended to be an indirect replacement for the ageing DS 3 supermini, the DS 3 Crossback is the second standalone model from DS since it split from Citroen in 2015. It'll sit below the DS 7 Crossback in the firm's range and rival the likes of the Volkswagen T-Roc and Toyota C-HR. It'll be the first DS model to be sold with an all-electric powertrain, with EV models boasting an official WLTP range of 186 miles. Prices are yet to be confirmed, but expect it to be considerably more than the £15,000 you'll pay for an entry-level DS 3. 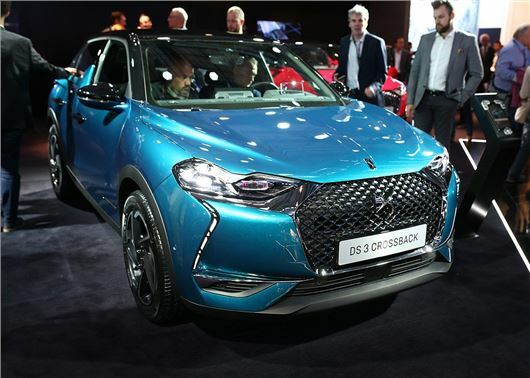 Powered by a 100kW motor (producing 136PS) and a 50kW lithium-ion battery, the DS 3 Crossback electric will take five hours to charge from a 11kW wall box. It can also be boosted from empty to 80 per cent in around 30 minutes, when hooked up to a 100kW fast charger. The DS 3 Crossback will go on sale in spring 2019.